Now Dyche is out for the season! Burnley’s injury crisis has deepened - now boss Sean Dyche is out for the season! The Clarets chief has been without skipper Tom Heaton since September, while summer signing Jon Walters has only been able to make one start through injury, and Robbie Brady and Steven Defour are out for the season. 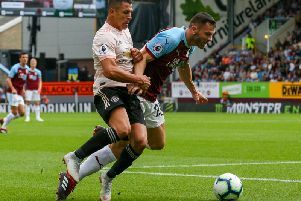 Add knocks and niggles to the likes of Chris Wood, Matt Lowton, James Tarkowski, Scott Arfield, Phil Bardsley and Dean Marney at various stages, and the squad has been as stretched as Dyche can remember. However, he didn’t think he would find himself in the treatment room. He couldn’t help but smile as he told of his misfortune on he warm weather training trip to Portugal last week: “I’ve ruptured my quad! Believe it or not, true story, I was knocking balls in for training, not even smashed it, and when you’re concentrating on something else, and doing something, at that split second, your brain isn’t locked in to what it needs to do, and my quad just went ‘boom’, properly ruptured. “It recovers in about 12 weeks, and you can play football again, it glues itself back. Dyche often comes in for pre-match press conferences after a run, but while that is off the agenda for now, he says he won’t have a problem patrolling the technical area: “I like running, so I can’t do that, but I’ll be alright standing for 90 minutes. “I’ve never done anything like that, had loads of injuries, but nothing with my thighs. It was the oddest sensation. “You can’t do this and that, and it’s really odd. “My leg is like jelly at the top. “I was knocking balls in for the session, not blasting them, as I clipped one, it went ‘boom!’, I went down, they all laughed! I was asked if it was cramp - no it wasn’t! Talking of training trips, unlike West Brom’s well-publicised camp in Barcelona, which ended with an incident involving skipper Jonny Evans, Gareth Barry, Boaz Myhill and Jake Livermore outside a fast food restaurant, involving a taxi, Burnley’s passed off as planned. Dyche admits it is difficult to get the balance between hard work and relaxation right: “I’m not here to judge anyone or any trips, the manager gets questioned, but the madness of modern life is, on one hand, people ask why don’t you treat them like men? You do, they let you down, and it’s your fault? “Where does that live? These are responsible people with lives, children, wives, girlfriends, whatever. “I’m not condoning any actions, but you’re judged quite harshly sometimes about a very simplistic situation where you say ‘lads, by all means do that, because you’re men’, or ladies, you know where the line is. “Where does that live in modern life? “In its purest form, every footballer, every manager knows everyone has a phone and people can’t wait to do you, and that’s what’s changed in society. “In my day, people were happy to come and have a chat with you, now, unfortunately, they can’t wait to get a photo, send it to whoever, ring whoever, and make a story of it. “It’s a shame. Don’t forget, all these footballers are ‘unapproachable’. That’s why. Dyche added: “As a manager you can only worry so much, what are you going to do? Do you go away to give them a different feeling and not give them a different feeling? “Sit in your room and you’re not allowed to do anything at all? “It can be like being a parent, but your power is only so far. Your power is to guide. “Parents guide, but growing up, you tell them and tell them, often your kid gets to a certain age where their eyes are going (middle finger gesture). “That’s parenting. They love you, you love them. They’re still looking at you like that. “Go and have fun, just be really careful. “I know a story makes a story, and people will say ‘they should do this’, but I think it’s really tricky. “Do you take them away, train all day and then sit in their rooms all night and play PlayStation? “Grown men, in this case. I think it’s tough. “You treat them like men, say it’s wise not to do this, and there will be a price to pay if they do. “But lets focus on having a good time, working hard, train, and relax. We trained, and often quite hard. Very hard one day. There’s a balance.